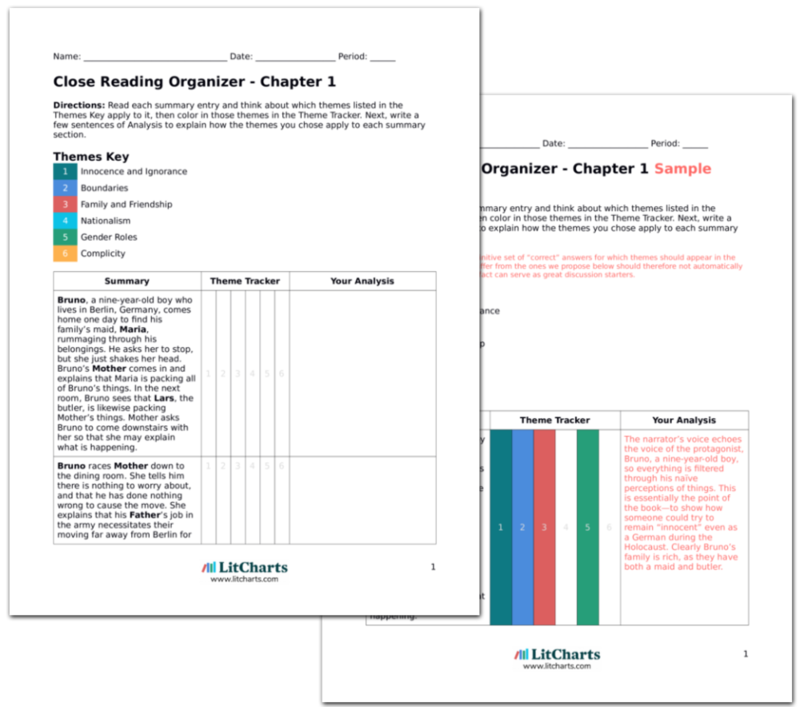 Instant downloads of all 942 LitChart PDFs (including The Boy in the Striped Pajamas). Shmuel does not show up at the fence for several days. Bruno is overjoyed when he finally does, but Shmuel seems very upset. He has not been able to find his father, and does not think Bruno’s father would be able to help, even though Bruno offers to ask him. He is sad when Bruno tells him he is going back to Berlin, and when Bruno suggests he come and visit, Shmuel does not seem to think that that would be possible. Shmuel probably knows that like the other people from the camp who go missing, his father won’t come back—but he still clings to an unrealistic hope, as any child might do in the face of such trauma. It’s never directly stated, but it’s inferred that Shmuel’s father dies, most likely in the gas chambers. Bruno, optimistic in his ignorance, suggests Father could help find him—even though it is Father’s direction that has led to his death. Bruno wishes they could play together just once before they have to part, and Shmuel lifts up the fence—there is enough room for Bruno to crawl under. Bruno is afraid he will get in trouble, but he has an idea—Shmuel could bring Bruno a pair of striped pajamas that he could change into and slip under the fence the following day. With Bruno’s head shaved, he would fit in with the other boys in the camp. Bruno returns home, excited for his adventure the following day. Bruno sees the search for Shmuel’s father as a kind of adventure, and Shmuel is touched that his friend would help him. Shmuel still clings to hope that his father is alive, and so is no longer concerned for his friend’s safety and innocence. Bruno is also excited at the prospect of finally seeing what life is like on the other side of the fence. All his “exploring” thus far has been benign and fun, so he still can’t seem to conceive of the dangers he is seeking out. Munk, Olivia. "The Boy in the Striped Pajamas Chapter 18." LitCharts. LitCharts LLC, 20 Jan 2016. Web. 20 Apr 2019. Munk, Olivia. "The Boy in the Striped Pajamas Chapter 18." LitCharts LLC, January 20, 2016. 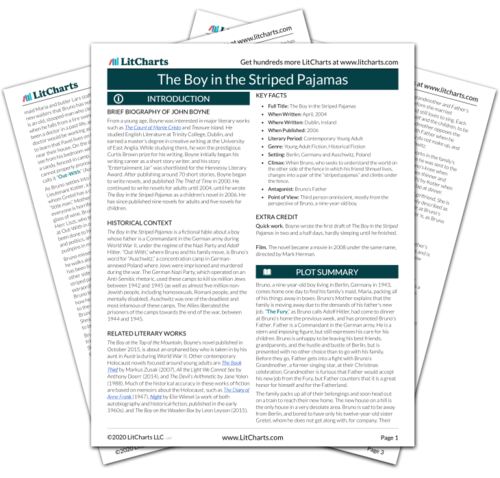 Retrieved April 20, 2019. https://www.litcharts.com/lit/the-boy-in-the-striped-pajamas/chapter-18.